If you want to see how I made this (and how you can too! ), visit my HDR Tutorial. I hope it gives you some new tricks! The HDR technique is fantastic for night shots of cities. You would think that you could simply open up the shutter for a long time and let the light stream in. Well, you can do that, but what usually happens is that some parts are over exposed while others are not quite bright enough. 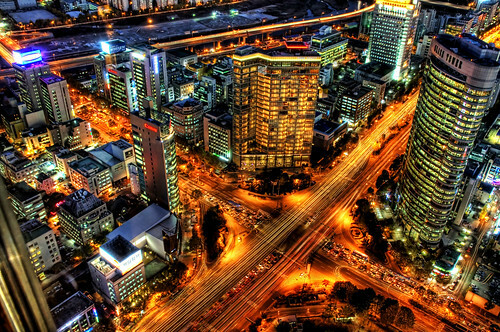 Each of those lights down there in the busy city streets of Seoul, Korea, have different intensities. The lights from the offices are quite dim compared to the signs on the buildings and even the taillights on the cars. The HDR process allows each of the lights to come through at an acceptable level.